Okra is a vegetable that gets a really bad rap. Since childhood it has been a favorite vegetable of mine and I can never get enough of it. Some think of it as slimy, but I think of it as both crispy and tender, naturally depending on how you cook it. And when I am eating okra, I especially enjoy it when the little white pods burst in my mouth with every chew. Buying good quality produce is a bit difficult in the Czech Republic and buying “exotic” fruits and vegetables is a bigger challenge. However, with the right connections, I can get as much okra as I want, among other essential ingredients to create a hearty Asian meal. 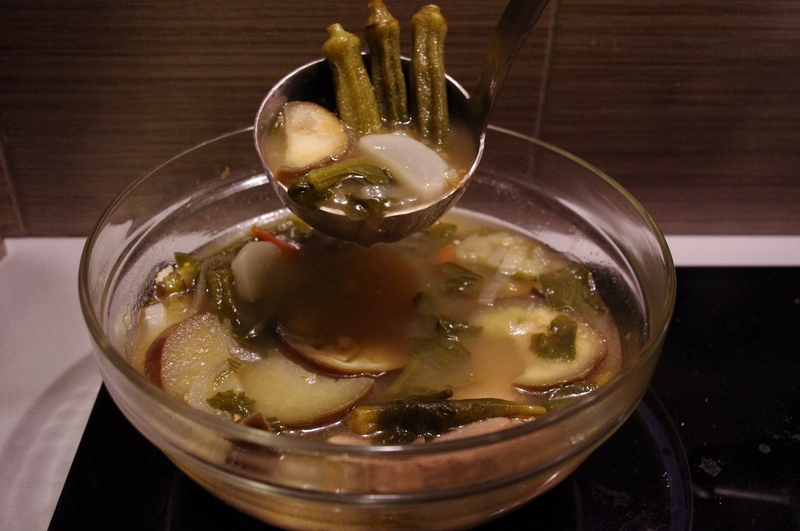 Usually, I cook a Filipino soup called Sinigang. Eggplants, green beans, onions, tomatoes, spinach and of course okra are the players and they are added to a tamarind broth, along with meat or shrimp. However you only need a third of the bag of okra for this dish. If I was back “home” I could easily buy some crabs, kabocha squash, fresh spinach, red chilis and fresh coconut milk and put one of my favorite Filipino dishes together, but that wasn’t going to happen here in Prague, especially in March. Lying ahead of me was a challenge, how could I cook okra in some other creative ways besides typically stewing them with tomatoes? After sifting through my large cookbook collection, I chose four to help me search for a fun way to cook my long, slender and green pods: Classic Indian Cooking by Julie Sahni, World Vegetarian by Madhur Jaffrey, The Sultan’s Cookbook by Ozcan Ozan and Claudia Roden’s The New Book of Middle Eastern Food. Each one had some simple, yet deliciously sounding ways to dish up okra. However, one of Madhur Jaffrey’s recipes really stood out. The dish came from Muslim Indians living in Uganda and after the vegetable is cooked with some flavorful spices like cumin, turmeric and cayenne, the serving suggestion was to add a” topping of scrambled eggs or omelette,” to the plate. 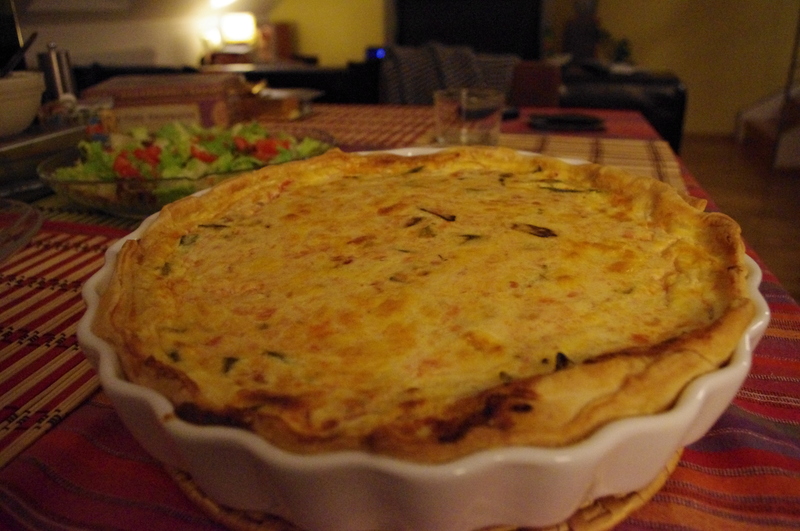 Well, that triggered a thought ” Why not try this as a quiche?” Here is my adaptation of Ms. Jaffrey’s “Okra with Tomatoes” from World Vegetarian. When hot, lower and add the garlic until it is slightly brown. Then add the onions and tomatoes. When the onions and tomatoes are soft, add the okra and cook until tender. When the vegetables are done, add the spices, salt and pepper. Warm up the oven at 180/350 degrees and prepare the pastry shell. Let the vegetables and spices mix for another 10 minutes. Meanwhile, in a bowl, beat the 4 eggs and add the cream, season with salt and pepper. Then transfer the okra and company to the casserole. Pour the liquid mixture over the vegetables. Then let it bake in the oven for 30 minutes or until slightly golden and firm. Heat oil in wok or non stick frying pan. When hot, bring down to medium heat and add garlic. When slightly golden, add onions and then tomatoes. When the onions and tomatoes soften up, add the okra. Stir fry for about 7-10 minutes. If you are working with a wok, the heat can be slightly higher. Then add the mushrooms and stir around for 1-2 minutes. Add the oyster and soy sauce. Stir and add water. Let the vegetables stew in the sauce. About another 10 minutes. To thicken sauce, stir the teaspoon of corn starch with a little bit of water in a small bowl. When it has turned into a paste, add it to the mixture and stir. 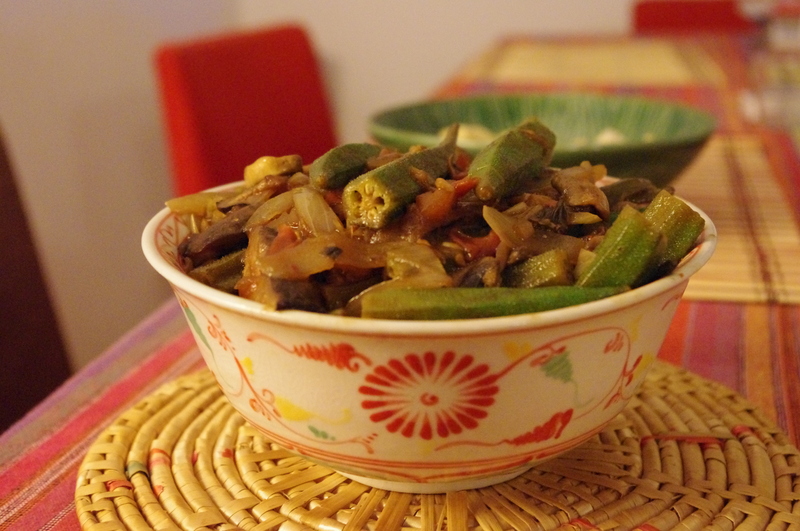 When the okra and mushrooms look tender, add the lime juice and chili flakes and let it cook for another 5 minutes. Serve with a warm bowl of jasmine rice. You may also add some tofu to this dish. We enjoyed it with a bowl of pan-fried tofu which I posted on a earlier blog.